This site is controlled and operated by Waterfowler.com at PO Box 886, Woodstock, IL, 60098. All material on this site, including, but not limited to images, illustrations, audio clips, and video clips, is protected by copyrights, trademarks, and other intellectual property rights which are owned and controlled by WFC or by other parties that have licensed their material to WFC. 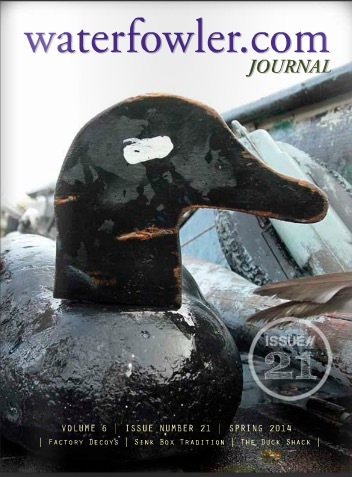 Material on Waterfowler.com or any web site owned, operated, licensed or controlled by WFC is solely for your personal, non-commercial use. Such material may not be copied, reproduced, republished, uploaded, posted, transmitted, or distributed in any way, including by e-mail or other electronic means. Without the prior written consent of the owner, modification of the materials, use of the materials on any other web site or networked computer environment, or use of the materials for any purpose other than personal, non-commercial use is a violation of the copyrights, trademarks, and other proprietary rights, and is prohibited. This site may contain links to other web sites (“Linked Sites”). The Linked Sites are for your convenience only, and you access them at your own risk. WFC is not responsible for the content of the Linked Sites, whether or not WFC is affiliated with sponsors of the sites. WFC does not in any way endorse the Linked Sites. WFC welcomes links to this site. You may establish a hypertext link to this site, provided that the link does not state or imply any sponsorship or endorsement of your site by WFC. You may not use on your site any trademarks, service marks or copyrighted materials appearing on the WFC site, including but not limited to any logos or characters, without the express written consent of the owner of the mark or right. You may not frame or otherwise incorporate into another web site any of the content or other materials on the WFC site without prior written consent. Any e-mails, notes, message/billboard/forum postings, ideas, suggestions, concepts or other material submitted will become the property of WFC throughout the universe. WFC shall be entitled, consistent with our policies regarding privacy, to use the material or any of its elements for any type of use forever, including in any media whether now known or hereafter devised. When you submit material to WFC’s web site, you agree that WFC has the right to publish or otherwise use the material or any of its elements for any type of use, including promotional and advertising purposes, subject to WFC’s policies regarding privacy. WFC may from time to time host bulletin boards, chat rooms, forums or other public posting areas (“Forums”). The information and opinions expressed in Bulletin Boards, Chat Rooms, or other Forums are not necessarily those of WFC or its affiliated or related entities or content providers. WFC makes no representations or warranties regarding information or opinions that appear in the Forums, and does not endorse or guarantee the accuracy of any posting. WFC assumes no obligation to monitor the Forums or to delete or edit any postings. However, WFC reserves the right to delete, move, or edit any postings that we consider illegal, inappropriate, or otherwise inappropriate. By using WFC’s web site, you agree that you will not submit or otherwise publish through the Forums any content which: (a) libels, defames, invades privacy, or is obscene, pornographic, abusive, or threatening; (b) infringes any intellectual property or other right of any entity or person, including, but not limited to violating anyone’s copyrights or trademarks; (c) violates any law; (d) advocates illegal activity; or (e) advertises or otherwise solicits funds or is a solicitation for goods or services. You agree to indemnify WFC and its officers, directors, employees, agents, distributors and affiliates from and against any and all third party claims, demands, liabilities, costs, or expenses, including reasonable attorney’s fees, resulting from your breach of any of the foregoing agreements, representations, and warranties. The materials on WFC’s web site are provided “as is” and without warranties of any kind either express or implied. WFC disclaims all warranties, express or implied, including, but not limited to, implied warranties of merchantability and fitness for a particular purpose, other than those warranties which, under the laws applicable to this agreement, are implied by law and are incapable of exclusion, restriction, or modification. Neither WFC, nor its affiliated or related entities, nor any person involved in the creation, production, and distribution of WFC’s web site warrant that the functions contained in the materials will be uninterrupted or error-free, that defects will be corrected, or that WFC or the server that makes them available are free of viruses or other harmful components. The material that you read on WFC’s web site is provided solely for entertainment and promotional purposes. WFC does not warrant or make any representations regarding the use or the results of the use of the materials in WFC’s web site in terms of their correctness, accuracy, reliability, or otherwise. You expressly agree that use of the WFC site is at your sole risk. You (and not WFC) assume the entire cost of all necessary servicing, repair or correction. You expressly agree that neither WFC, nor its affiliated or related entities, nor any of their respective employees, or agents, nor any person or entity involved in the creation, production, and distribution of WFC’s web site are responsible or liable to any person or entity whatsoever for any loss, damage (whether actual, consequential, punitive or otherwise), injury, claim, liability or other cause of any kind or character whatsoever based upon or resulting from the use of this site or any other WFC web site. By way of example, and without limiting the generality of the foregoing, WFC and related persons and entities shall not be responsible or liable for any claim or damage arising from failure of performance, error, omission, interruption, deletion, defect, delay in operation, computer virus, theft, destruction, unauthorized access to or alteration of personal records, or the reliance upon or use of data, information, opinions or other materials appearing on this site. You expressly acknowledge and agree that WFC is not liable or responsible for any defamatory, offensive or illegal conduct of other subscribers or third parties. Unless otherwise specified, the materials in the WFC web site is presented solely for the purpose of entertainment and promoting programs and other products available in the United States, its territories, possessions, and protectorates. This site is controlled and operated by WFC from its offices within the State of Illinois, United States of America. WFC makes no representation that materials in WFC’s web site is appropriate or available for use in other locations. Those who choose to access this site from other locations do so on their own initiative and are responsible for compliance with local laws, if and to the extent local laws are applicable. This agreement shall be governed by, construed and enforced in accordance with the laws of the State of Illinois, as it is applied to agreements entered into and to be performed entirely within such State. Any action you, any third party or WFC bring to enforce this agreement or, in connection with, any matters related to this site shall be brought only in either the state or Federal Courts located in McHenry County, Illinois, and you expressly consent to the jurisdiction of said courts. If any provision of this agreement shall be unlawful, void, or for any reason unenforceable, then that provision shall be deemed severable from this agreement and shall not affect the validity and enforceability of any remaining provisions. This is the entire agreement between the parties relating to the matters contained herein and shall not be modified except in writing, signed by WFC. Waterfowler.com is committed to providing a fun, safe and secure website for people of all ages. We are dedicated to safeguarding all personal information collected online and to helping our visitors learn how to exercise control over personal information while exploring the Internet. To help ensure a rewarding online experience for all visitors, we provide this summary of our information practices. This privacy notice governs the collection and use of information at Waterfowler.com. As we continue to offer our visitors new and different types of content and services, we may modify our practices from time to time. As a user of WFC’s interactive services, you agree to review this statement annually to remain informed of our policies and practice. WFC collects personal information when you register with WFC, when you use WFC products or services, when you visit WFC pages or the pages of certain WFC partners, and when you enter promotions or sweepstakes. WFC may combine information about you that we have with information we obtain from business partners or other companies. When you register we ask for information such as your name, email address, mailing address, zip code, and information about your interests. Once you register with WFC and sign in to our services, you are not anonymous to us. WFC collects information about your transactions with us. Credit card information is used for one-time billing purposes only and stored in an encypted manner. WFC’s credit card system only retains the last four (4) digits of your billing information. WFC does not offer or practice recurred billing transactions. WFC automatically receives and records information on our server logs from your browser, including your IP address, WFC cookie information, and the page you request. WFC uses information for the following general purposes: to customize the advertising and content you see, fulfill your requests for products and services, improve our services, contact you, conduct research, and provide anonymous reporting for internal and external clients. It is against WFC policy for a Child under age 13 to register with WFC, we ask that he or she have a parent or guardian create a WFC Account and obtain parental permission. We may rent, sell or share personal the information of Opt-In users to trusted partners who work on behalf of or with WFC under confidentiality agreements. These companies may use your personal information to help WFC communicate with you about offers from WFC and our marketing partners. However, these companies do not have any independent right to share this information. WFC does not provide any personal information to the advertiser when you interact with or view a targeted ad. WFC advertisers include financial service providers (such as banks and lending institutions) and non-financial companies (such as retailers and manufacturers of outdoor, and non-outdoor, related products). WFC works with vendors, partners, advertisers, and other service providers in different industries and categories of business. WFC may set and access WFC cookies on your computer. WFC may let other companies that show advertisements on some of our pages set and access their cookies on your computer. Other companies’ use of their cookies is subject to their own privacy policies, not this one. Advertisers or other companies do not have access to WFC’s cookies. You can edit your WFC Account Information, including your marketing/opt-in preferences, at any time by editing your account profile. To edit your acount profile, log in using your username and password, then click on your username to edit your account preferences. If you need assistance editing your profile, please call 815-337-8300. We reserve the right to send you certain communications relating to the WFC service, such as service announcements, administrative messages, renewal notices, and the WFC Wingbeats Newsletter, that are considered part of your WFC account, without offering you the opportunity to opt-out of receiving them. You can delete your WFC account by calling 815-3378-300. WFC may update this policy. We will notify you about significant changes in the way we treat personal information by sending a notice to the primary email address specified in your WFC account or by placing a prominent notice on our site. Waterfowler.com, PO Box 886 Woodstock, IL, 60098.